Matt Magarian and his excellent installation crew just wrapped up another green outside of Sacramento, CA at Sierra View Country Club in Roseville. This club opened in 1953 and was designed by Jack Fleming. This was the second green we have installed our unique subsurface drainage system after an initial trial on their putting green a year ago was received very favorably. Interesting enough, assistant superintendent at Sierra View, Cliff Carpenter got exposure to XGD Systems during his schooling at Rutgers several years ago and convinced Sierra View super Kyle Dykstra to reach out to us over a year ago. This week Matt and crew return back to North Ridge Country Club where they just completed a few greens last week to restore three bunkers for superintendent Larry Johnson. This scope of work revolves around sand replacement, re-edging, and lowering of a few of the mounds in back of the bunkers, as well as a freshening up of the turf in the process. North Ridge was also built in the early 1950’s as well by busy CA golf architect William F.Bell. 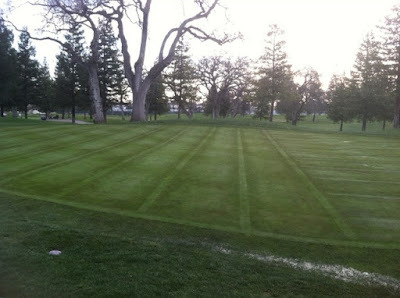 Besides these NorCal projects XGD has completed some greens in SoCal as well at Wilshire CC and Oakmont CC in Glendale. These greens completed in a near desert climate are not for traditional drainage purposes, as this region seldom exceeds 2-4″ of annual precipitation. Rather, the focus for these installations is to provide a means for sodium flushing on these poa annua pushups. After summer seasons of heavy non-potable irrigation, the salts can build up in the soil profile, and leave these greens susceptible to turfgrass rapid blight. The XGD System allows these clubs to periodically flush the bicarbonates deeper in to the soil profile, and provide a healthier growing environment for the turfgrass rooting system. Overall, a general flushing of old pushup greens is becoming more and more common across the continent, as the revived turfgrass conditions after a deep irrigation flush, or from the sky’s above are a testament to this old practice. However, rarely do these old pushups have internal greens drainage, and that is where XGD can come in and provide this surgical service. So reach out to us, if we can get you some numbers for your internal greens drainage program, and look for us at our booth at the GIS12 show in Vegas next week.